I've had Lady Catherine, the Earl, and the Real Downton Abbey sitting on my bookshelf for quite a while now. I don't even want to say how long . . . but it's been awhile. I'm trusting that by the time this review posts I will no longer be sick and that I can safely say that I read this when I was sick and confined to the couch for three (excessively long) weeks. The only nice thing about being that sick for that long (at the same time as every other member of your family) is that you really can't do anything but watch movies and read books. We've done a lot of both. I pulled out a stack of books that I'd been wanting to get to but had not yet read and proceeded to work my way down the stack. Lady Catherine was near the top of the stack. I'd been excited to read it after devouring the (current) Countess of Carnarvon's first book, Lady Almina and The Real Downtown Abby. (Title linked to my review in 2012.) Lady Almina was Lady Catherine's mother-in-law. Catherine married into the Carnarvon family and became the new Countess upon the death of the 5th Earl (which you might recall as the one who funded the excavation of King Tut's tomb). Lady Catherine's tenure at Highclere Castle (aka Downton Abbey) looked remarkably different than you might expect. She was not the Countess for an extremely long period of time, because she and the 6th Earl divorced, which meant that she was required to leave the castle. Catherine's husband "Porchy", being the title bearing heir of the estate, stayed. Due to the nature of Lady Catherine and Porchy's relationship, this book was not as fun to read as the one about Lady Almina. Catherine's story begins and ends well but everything in the middle is rather messy. In saying that, I can hear the fussing already. I'm sure you want to tell me that life is messy and we shouldn't avoid such reads. It is very true and I will agree with you that life is messy. History is full of unpleasant things. We shouldn't avoid learning about things just because we find them unpleasant. Not at all. I can read this book but also not enjoy the fact that her marriage to Porchy fell apart and find it a difficult-to-unpleasant read as a result. Whether or not something is "realistic" or "good for us to know" doesn't mean that it's not equally a hard thing to endure. 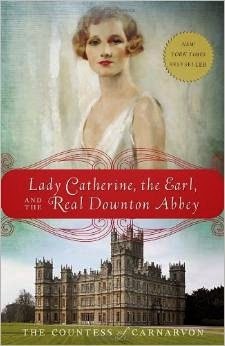 Lady Catherine, the Earl, and the Real Downton Abbey was simply not as fun to read as the first book. What did pique my interest is the history surrounding the castle. The current Countess of Carnarvon fills this book with the history and culture of the 1920's, 30's and 40's. Those decades were full of hardships for England and she writes a lot about the role which Highclere Castle played during certain historical events. She notes who the Carvarvon family were friends with (i.e., Porchy rubbed elbows with Winston Churchill ) and how the family responded to news of the war against Germany. It's really very interesting from that perspective. To be perfectly honest, reading Lady Catherine felt a great deal more like watching a few seasons of Downton Abbey. The historical notes (i.e., position of women in society, treatment of homosexuals, bravery in war, relationships to staff during hard times, etc.) that the Countess makes are strikingly similar to the points which the television series also wishes to drive home. Now, grant it, the 1920's and 30's were a time of real change in the way society viewed and handled a plethora of issues. Societal rules were being roundly challenged and so it makes the book (and the tv series) quite the soap opera (yes let's just confess that, shall we?). Porchy has a wandering eye and it's irritating to read about. Lady Catherine has to find her new place in society as a fairly well-to-do but divorced woman. Things in this book are all rather high on drama. For me, the magic of Lady Almina was in learning the behind-the-scenes history of the people who lived at the castle - together. It's in hearing about Lord Carnarvon's passion for finding treasure in Egypt; his struggle to make a mark on the world. Lady Almina and her husband just seemed to have more gumption and stick-to-itiveness about them that I enjoyed reading about. Lady Catherine just didn't have the same "oomph" about her, although I do think she was a very kind woman who loved deeply and who appreciated and adored her family. She was admirable too but in a different way. And, I think, she suffered greater challenges in part because she lived in "changing times." I declared before that I would read Lady Almina and the Real Downtown Abbey over and over again. I would too! I will. But I can't say that I really want to read about Lady Catherine, the Earl, and the Real Downton Abbey more than once. I have never watched Downtown Abbey and so have never been drawn to the books either. But I do enjoy your reviews. Glad you are feeling better! 3 weeks?! Wow. And, I was feeling sorry for us at being sick a week(so far). I hope y'all are feeling better now, though! I STILL haven't made it into the land of Downtown Abbey, but maybe soon. I haven't gotten on the Downton Abbey bandwagon either, but I'm commenting to say I'm SO sorry you've been so sick for so long and pray you're indeed feeling better! I am pretty late to the party (I type this after I read three comments from people who haven't watched Downton Abbey) but I just started watching it. I tried to get John watching, but it wasn't going to happen. But I would be interested in reading the actual background of it. I'm sorry you've been ill for so long. I hope you're well on the road to recovery now. I'll look for both these books. Any other "real Downton Abbey" books around? Sounds to me like Porchy and Lady Catherine's marriage could have been the model for "Shrimpy" and Lady Susan McClare in Downton Abbey (Rose's parents). Sorry you've been sick so long - glad everyone's getting better.